This week's Health & Wellness guest is Hope (McCarthy) Metzger. Hope and I went to North Allegheny High School together way back when, and it's been great to reconnect with her recently. Hope is a busy mom of three boys, an amazing athlete and fitness instructor, and is actively involved in her community. If you know Hope, you know she's energetic, full of life, and so positive. It's a pleasure having her as our featured guest! I live in Wexford (PA) in a small neighborhood 1 mile from my childhood home. I joke the umbilical cord wraps around the block! My husband Jim and I, who met at a fraternity party at Penn State, are approaching 20 years of wedded bliss. We have 3 sons; twins age 13 and a 9 year old firecracker. A high school special education teacher for over a decade, I currently teach ballet barre fitness classes at the Dailey Method, lead running groups at our local elementary school, work as an administrator for a financial planner, and sell Beautycounter. Tell us about your role in the health and wellness industry. Why is this such a passion for you? My biggest passion is being with people. Helping them feel healthy, happy, and successful is the goal, and I feel validation after it’s achieved. At Bradford Woods Elementary, I lead a 13 week running group concluding with the Pittsburgh Kids Marathon. Each week has a theme, a lesson, and a run. The 20 kids in the group learn about proper form, pacing, and nutrition. At the studio where I teach, it’s wonderful to work with women who have a range of abilities -- from pregnancy, to returning after giving birth or having surgery, to ramping up workouts to improve strength and flexibility. For me, teaching fitness classes is as rewarding as working in a school. I jumped on the Beautycounter wagon because I feel strongly about what my family and I put on our largest organ -- our skin. Safe products are vital to our health. I’m currently working on a project to bring Chemo Care Poufs -- little bags filled with gifts and safe products -- to women receiving treatment at the Hillman Cancer Center. Last year 150 poufs were provided over Thanksgiving weekend, and this year we’d like to provide even more. At my boys’ schools, I volunteer with the Traveling Art Gallery and book fair, I'm a homeroom parent, and I love any way to be involved with my sons. For years I taught CCD and Vacation Bible School. It’s impossible to choose one person as my biggest inspiration because I feel inspired by so many people. From professional athletes who are talented, driven, and who constantly sacrifice to be the best at their sport; to regular people who make health a priority by exercising daily, pushing themselves to improve, and eating whole foods. My husband is someone who motivates me. At 36, Jim had major hip surgery, resulting in an inability to run long distances. Running marathons was something we did together. We’d hire babysitters and go on “running dates." Undeterred, Jim took up biking, formed a group, and he enjoys the trails in North Park with friends every weekend. What do you like to do for fun? Any guilty pleasures? For fun, I love to run or walk with friends, attend my kids’ games, spend time with my extended family, and read for the two book clubs to which I belong. Like many females, a favorite activity is shopping! Most evenings, my husband and I sit on the couch with a beer or glass of wine, and we reflect on our day. Another indulgence -- I enjoy dark chocolate and tortilla chips more than I should. Life is short! What are some tips you would give someone trying to optimize their health? My tips for optimizing health and wellness -- choose a goal, plan workouts, track progress, and maintain accountability. What would you like to achieve? Write it down. Schedule workouts in your calendar and stick to them. Your health is a priority. Use technology -- an app or spreadsheet to track progress toward your goal. Celebrate the steps along the way. Stay accountable by meeting a friend to exercise. 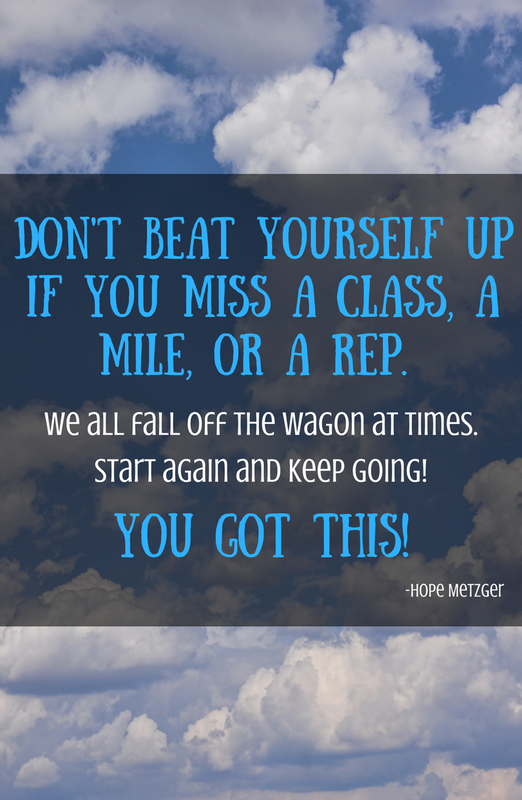 And finally, don’t beat yourself up if you miss a class, a mile, or a rep. We all fall off the wagon at times. Start again, and keep going. You’ve got this! Give us your contact info! I hope you've enjoyed this interview with Hope. What an inspiration she is! I would invite you to visit the Dailey Method site to learn more about their classes. There are studios throughout the country. And definitely take a look at the Beautycounter link. Currently, there are some GREAT PROMOTIONS being offered! I've mentioned before how much I love Beautycounter because their products are non-toxic and very safe. This is right in line with the message of 360 Health. Be sure to subscribe to Kim's blog on the HOME page to get the latest articles as soon as they're published! And if you haven't already checked out her book 360 Health: Your Guide to Cancer Prevention, Healing Foods, & Total Body Wellness, you can get it below!